Picking out the right metal detector for the right treasure hunting experience is crucial to its success. What most people don't know is that this piece of advice also translates to the type of sand scoop used for digging up treasure near sand and water. By picking out the right sand scoop for the job, targets can be recovered much faster and with greater ease. The first thing to think of when choosing a sand scoop for metal detecting is where it will be used. Using any sand scoop for metal detecting inland and away from water will protect it from the corrosive properties of salt water. For metal detecting near larger bodies of water, it is imperative to get a metal sand scoop that can stand up to these abrasive elements. That's why most metal detecting enthusiasts, who hunt near the sea, use a stainless steel beach scoop that can stand up to corrosion. However, there are newer plating methods being produced to stop metal detecting scoops from corroding. Nevertheless, it's better to use a stainless steel metal scoop when treasure hunting near any body of water because its never full proof. There is also the size of the sand scoop to consider. 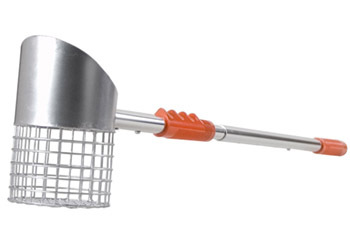 Metal detecting scoops come in three distinct sizes: short handle scoops, medium handle scoops and long handle scoops. Short handle scoops are perfect for sandboxes, the beach or anywhere with loose soil. The upside to using a short handle for metal detecting is that they're great for getting exercise. Medium handle scoops are great for sandy beaches where the depth of targets are not always exact. Long handle sand scoops are made for digging into water on the beach or near the shoreline a breeze. These large handle scoops are great for any depth of water because most rings and jewelry are found at waist deep. Lastly, the type of sand scoop can affect the metal detecting experience based on where the digging is taking place. Metal detectorists will typically use a wire mesh sand scoop for dry sand. These wire mesh sand scoops are great for digging up the smallest of treasures. Using this same wire mesh sand scoop on wet sand or in the water however will destroy the mesh lining by clumps of sand and rocks. In that case, it would be wise to use a long handle sand scoop with stainless steel coating for wet sand or in the water. A long handle sand scoop is just as easy to use in water as a short handle is in dry sand because of the water's buoyancy. Finding the right sand scoop is just a matter of practice, patience and knowledge. Once the right sand scoop for metal detecting has been found, it becomes even more simpler to find that treasure of a lifetime. All there is to it is to get digging!